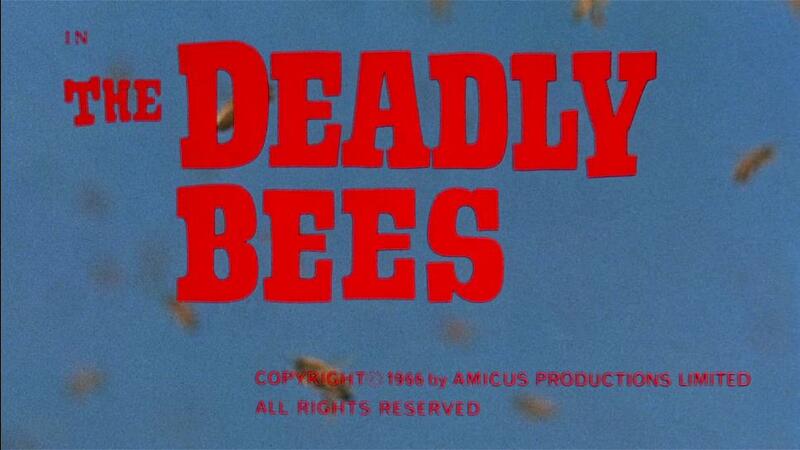 Absent during home video's early years but now getting its second disc release within a decade, 1966's The Deadly Bees was a British import from Amicus Productions released by Paramount in the US, who put it out primarily as half of a double feature at drive-ins. This makes a lot of sense as the movie is decent entertainment but not quite satisfying enough for a whole evening's worth. With a screenplay initially written by Robert Bloch (best known for Psycho), The Deadly Bees stars Suzanna Leigh as popular singer Vicki Robbins, whose management has been pushing her a bit too much and she ends up collapsing onstage during a TV show appearance. 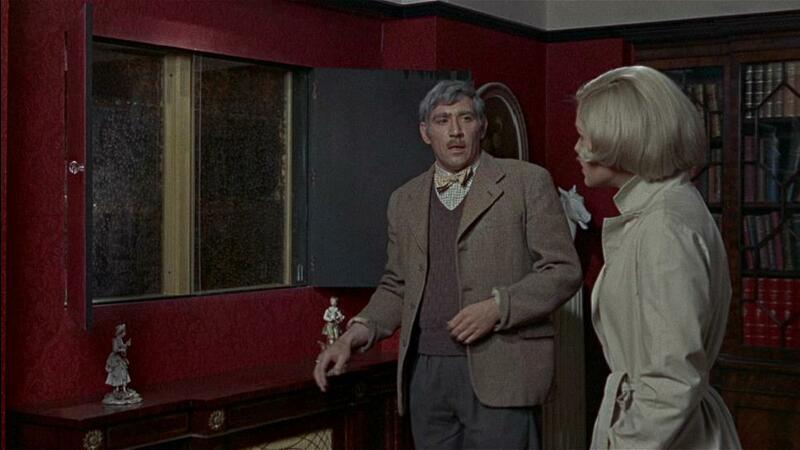 Her doctor feels she needs some time off, so he arranges to have her stay on Seagull Island for a few days at the farmhouse of his friend Ralph Hargrove (Guy Doleman) and his wife Mary (Catherine Finn). They set up a room for her, but it's a bit awkward as the married couple doesn't do much besides argue with each other. Mr. Hargrove is particularly obsessed with raising bees, which his wife doesn't care for too much. While out walking the Hargroves' dog, Vicki meets neighbor H. W. Manfred (Frank Finlay) who coincidentally is also an avid beekeeper. He and Hargrove have been having a bit of a silent feud and Hargrove warns her to stay away from him, but he seems friendly enough while Hargrove increasingly gives her the creeps. 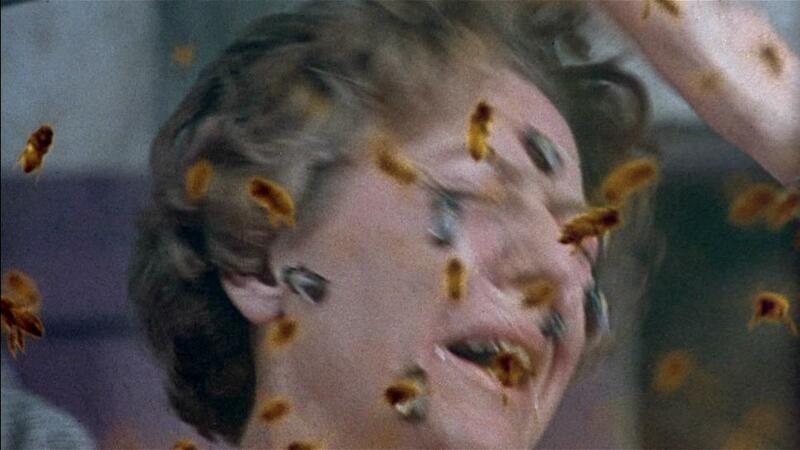 The creepiness intensifies when swarms of bees begin attacking on the Hargrove property, first killing their dog and later stinging Mrs. Hargrove to death! Manfred is certain that Mr. Hargrove is behind this somehow, and asks Vicki to start digging up clues. Vicki really wants to leave, but she's stuck on the island for at least a few more days as there aren't many boats that arrive there. Olive Films' Blu-Ray uses the same transfer as Legend Films' previous DVD, and having that on hand to compare shows that the high-def format brings out a lot of detail that is essentially blurred on the DVD- signs in the background are readable as are the titles of books on shelves. While not exactly a visually striking movie, fans will find it worth the upgrade. Colors are a bit light (likely intentionally) but the print is very clean. Thankfully Olive seems to have overcome the compression problems that plagued some of their previous discs, as those are absent here. The cast of The Deadly Bees makes this a better-than-average "bad movie". Not a whole lot happens, but its running time is also short which makes for a decent double-feature with something a bit more substantial. Picture quality is a definite upgrade from the previously-issued DVD from Legend.